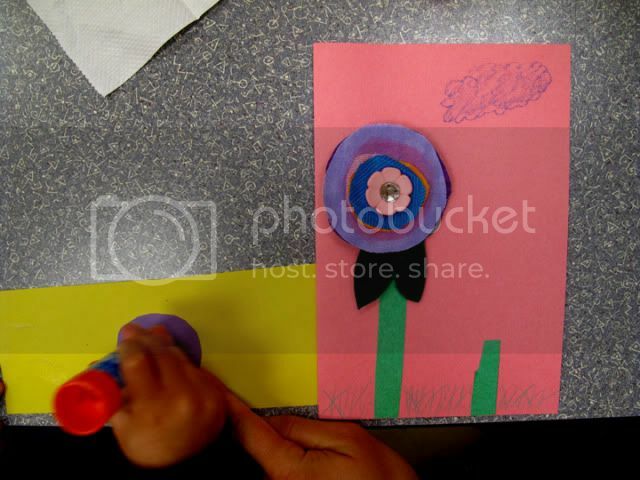 Today my class of kiddos ages 3-5 came in with the favorite men in their lives to make something very special for Mom. 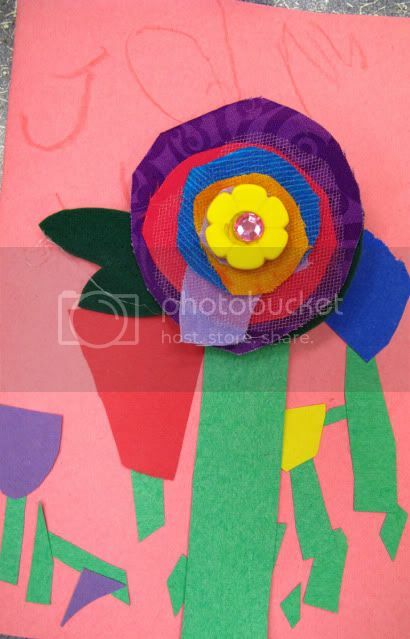 We designed a fabric brooch for Mom and pinned it to a hand made card. Very special indeed. I focused on fabric/textiles and design of this brooch to revolve around the exciting new exhibit at the OKCMOA, Sketch to Screen: The Art of Hollywood Costume Design. This new exhibit has been years in the making and was put together specially by our curators specifically for the OKCMOA. If you are local, I encourage you to come see this unique new exhibit that will be up through the summer. It has something for everyone of all ages. This took a bit of prep work. I pre-cut all of the pieces. 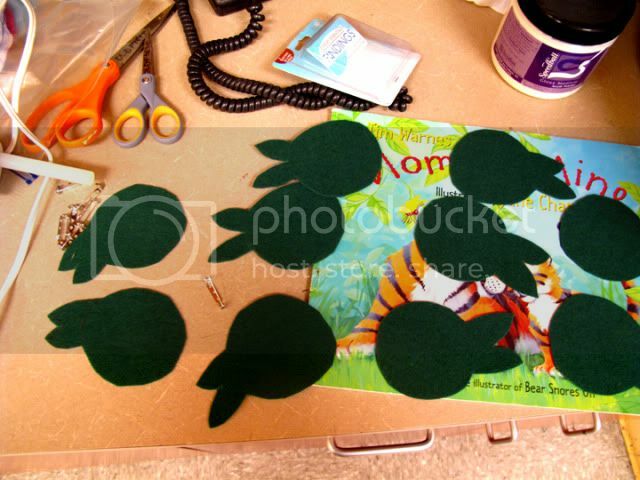 I cut stiff green felt for the backing and several fabrics of different colors and textures in 3 sizes, the largest circle being the size of the green felt. 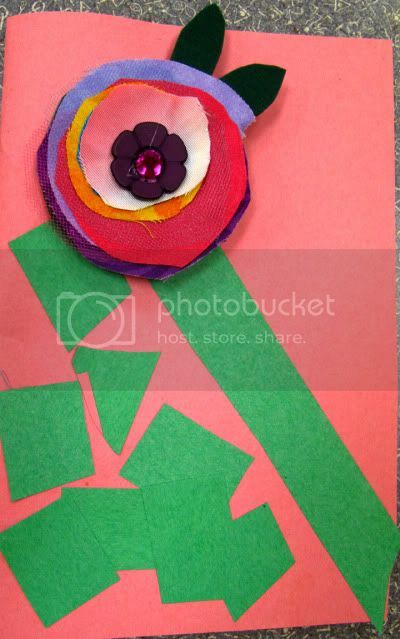 The kids worked with their dads to assemble their brooch. 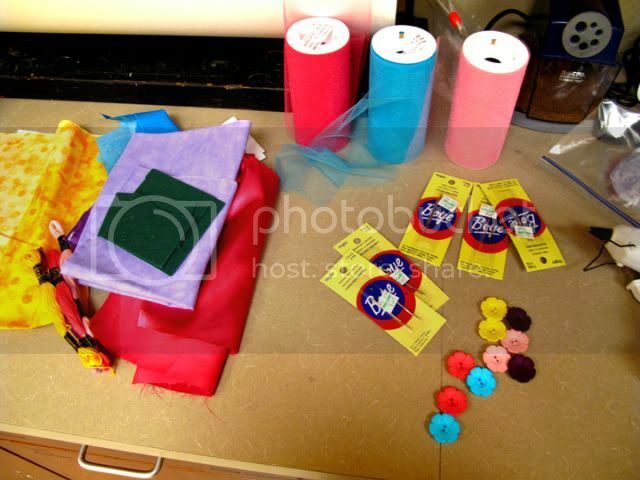 They made design choices by deciding which fabrics to use and what order to put them in. 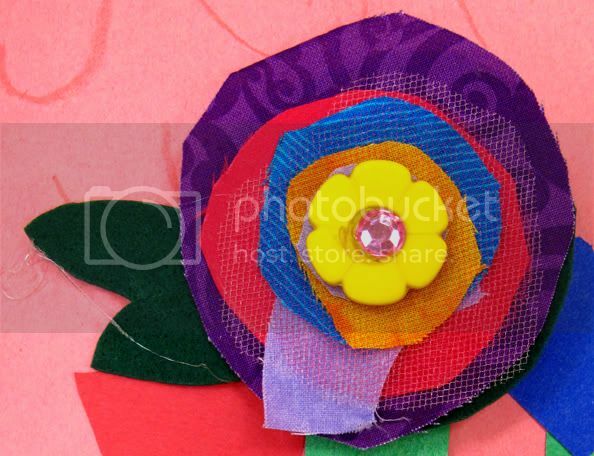 When they were fully assembled with fabric, the dads used a yarn needle to attach a medium size flower button through all the layers to the top. To the top I hot glued a little sparkling gem to cover the thread and hot glued a bar pin to the back. 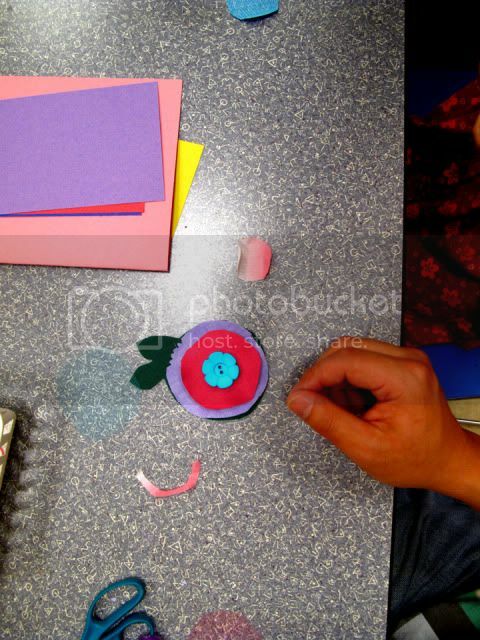 When the brooch was finished we worked on a card to pin our brooch to. 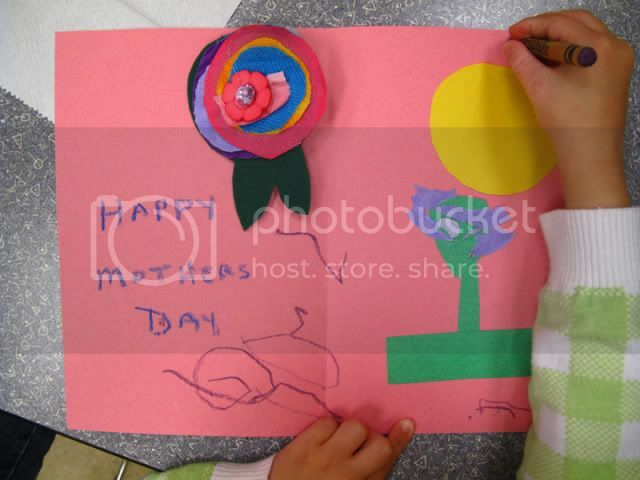 We used construction paper and crayons to decorate the card. They wrote their messages and pinned on their brooches and we left the class to visit the exhibit. Perfect little gift full of a lot of love! -fabrics of different colors, textures and sizes. OOH, love it! This is my first time at your blog, I came from Ramblings of a crazy woman link up. KJ- I am so happy you found me! Thanks for commenting! These are gorgeous, we love the sweet and wearable addition to the Mother's Day card! These would also make great birthday cards. What a perfect way to use up scraps. 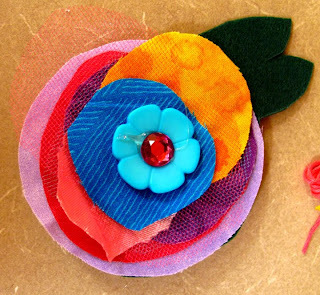 I am featuring this project today for Flower Week! 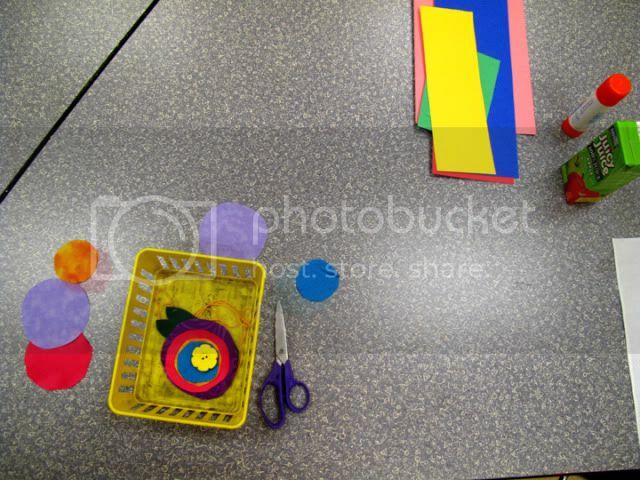 Thanks for sharing...my playgroup families will have fun making these together I am sure.